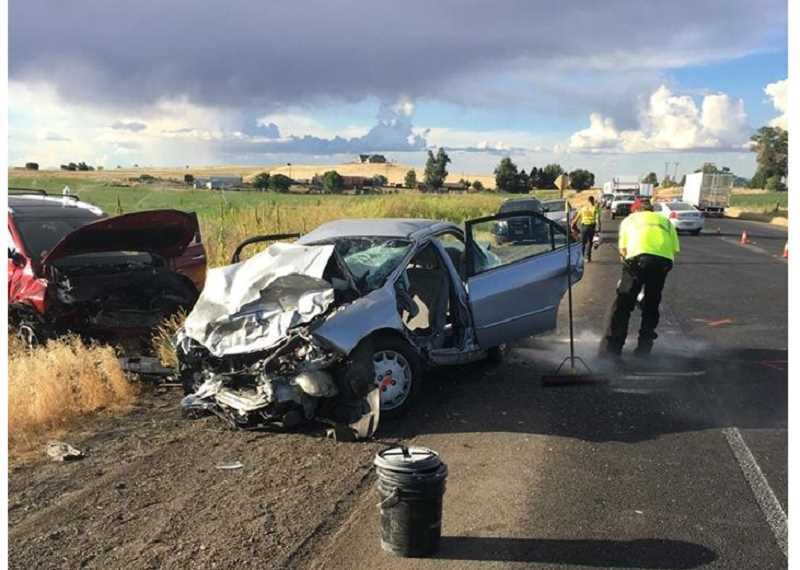 A head-on crash on U.S. Highway 97 on Aug. 4, resulted in injuries to five people in two vehicles. Oregon State Police responded to a crash on U.S. Highway 97, near Iris Lane on Saturday, Aug. 4, at 5:12 p.m.
OSP reported that the driver of a maroon Kia Sorrento, Mindy Cox-Bland, 35, of Madras, swerved onto the northbound shoulder of the highway to avoid an animal and lost control of the vehicle, colliding head-on with a silver Honda Accord, driven by Philip Jones, 25, of Portland. Jones and three occupants of his vehicle were transported by Jefferson County Emergency Medical Services or air ambulance to area hospitals. Cox-Bland was transported by JCEMS to St. Charles Madras. The highway was closed for about 2 1/2 hours. OSP was assisted by the Jefferson County Sheriff's Office, Jefferson County Fire Department, and JCEMS. No other information was available from OSP.